Free access to OSHA-10 classes up to three times each year, and OSHA-30 classes at least once each year. Safety Training and Evaluation Process (STEP) Certification – What if your company could be 770% safer than the industry average? Established in 1989, STEP was developed and written by ABC contractors, and provides s a safety benchmarking and improvement tool that dramatically improves safety performance among construction industry participants regardless of company size or type of work. 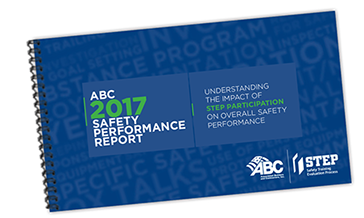 Participating ABC member firms measure their safety processes and policies on 20 key components through a detailed questionnaire, with the goal of implementing or enhancing safety programs that reduce jobsite incident rates. Click here for more information. What if your company could be 770% safer than industry average? Safety Course Offerings – ABC Central Ohio schedules selected safety courses throughout the year. Some are predetermined, while others are scheduled following member requests. A sample list of course that have been offered in the past include, but are not limited to the following. If you have a specific need, please contact our office and we will see if we can schedule additional course offerings. Safety Roundtable – ABC Central Ohio has your best interests in mind as we meet to discuss ways we can assist you in developing or strengthening the safety culture in your company. We feel that one of the ways we can best accomplish this goal is by sharing ideas and best practices with each other. Safety Committee – ABC Central Ohio relies on its members to keep our chapter moving forward and delivering the best services possible to our membership. We invite you to become involved in this process by having people within your organization with experience, knowledge or interest in construction safety to serve on the Safety Committee. For more information about our safety training programs, contact ABC Central Ohio Chapter at 614-529-4300, or send us message.